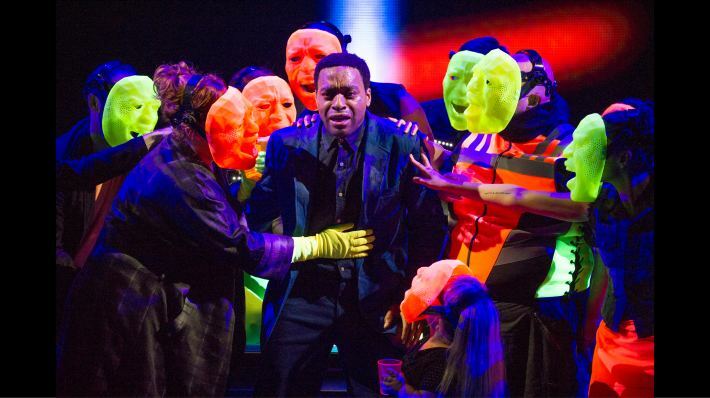 Chiwetel Ejifor makes quite an entrance in Everyman, the first production directed by Rufus Norris since taking over as artistic director of London’s National Theatre. The 12 Years a Slave star plunges in slow-mo from the heavens into a sunken onstage pit, a symbolic precursor to his character’s plight in this updated version of the classic medieval morality play about one fellow’s end-of-life reckoning with God and Death. Ejifor’s Ev is a high flyer in another sense, too: a hedonistic lad-about-town who kicks off the show with a coke-fueled, electronica-scored 40th birthday party that lasts a smidge too long. But the debauchery produces not only a hangover but the arrival of the drily witty figure of Death (Dermot Crowley). 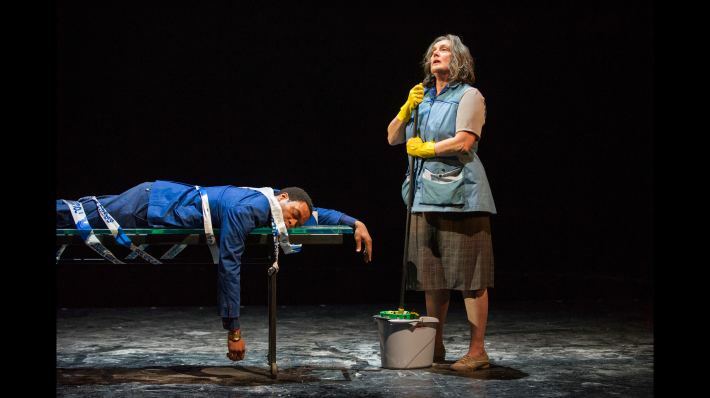 God, meanwhile, continues to move in mysterious ways — in this case, pushing a broom and dustbin as a dumpy cleaning lady with a world-weary attitude toward her wayward creations. Kate Duchêne plays the role with a skillful blend of omniscience and resignation. How do you retell a morality play in an age in which organized religion — indeed, a belief in God — has been pushed to the margins? In Poet Laureate Carol Ann Duffy’s spiritedly modern free-verse translation, which veers from blunt and bawdy to lyrical in a flash, you simply recast the nature of sin in more secular terms. The greatest blasphemy for our contemporary, post-religious Ev is not blasphemy but selfishness and a failure to confront challenges like homelessness and environmental degradation that threaten all of existence.